All photos and words by Sarah Hoffman. 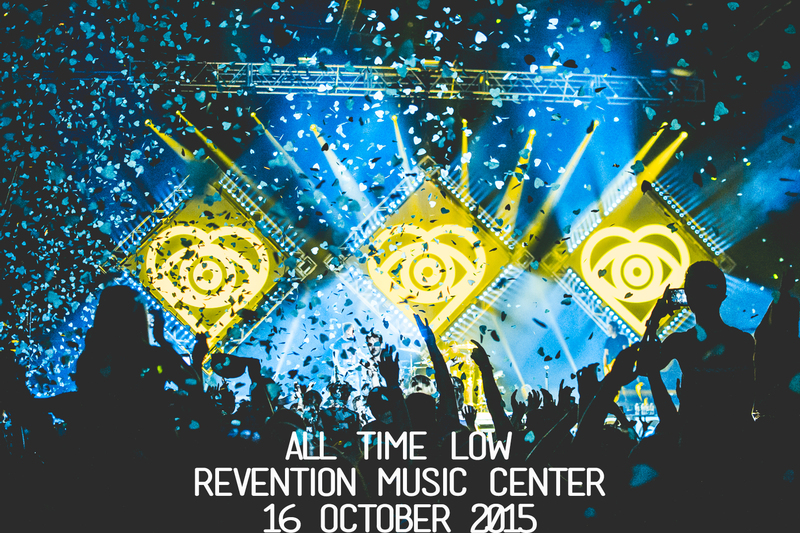 All Time Low performed in Houston this weekend for what feels like the millionth time in their career. The Baltimore natives, who formed about 12 years ago, have been performing in Houston since 2006. So far, none of the shows–at least any of them in the last five years here–have been a disappointment. Despite the fact that they tour so often, the band always manages to bring something new to each show, to each tour. 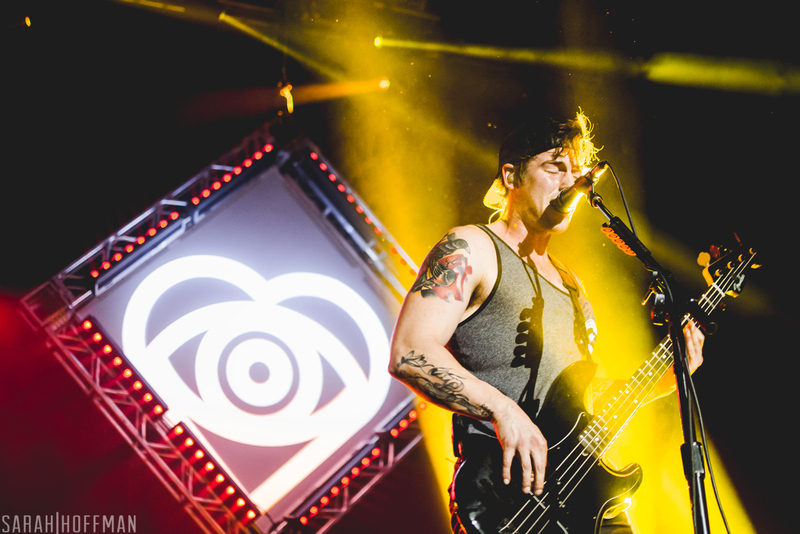 This time around, they decided to heavily focus the setlist on their newest album Future Hearts. Of course, the tour was aptly named “Back to the Future Hearts Tour,” paying homage to Oct. 21 being the future date Marty McFly traveled to in the “Back to the Future” film (despite the many memes and photoshopped images that have floated around the last few years, Oct. 21 is in fact the correct date). Anyway, back to the show. It started early with Japan pop-rockers One Ok Rock, so early in fact, that I managed to make it into the venue when the band was already meeting a long line of fans. At first glance, they seem like an odd addition to the tour, but over the last few summers, the band has gotten quite acquainted with the US pop-punk scene because of their time on the Vans Warped Tour. 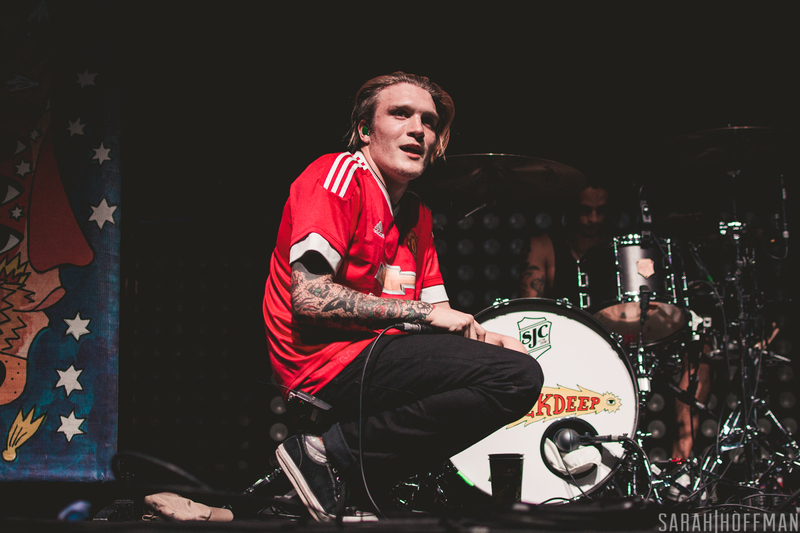 UK band Neck Deep poke fun at themselves, labeling their music “generic pop-punk,” but their performance was anything but generic. The crowd hadn’t quite filled the room yet, so at first, something seemed off. However, after their second or third song, many of the concertgoers proved themselves to be fans of the band. Hundreds of voices soon filled the empty spaces of the room. Sleeping With Sirens are no strangers to All Time Low fans because they’ve toured together countless times (along with the likes of Pierce the Veil and A Day to Remember). They unofficially co-headline the tour, playing an impressive 15 songs before All Time Low finishes out the night with about 19 tunes. 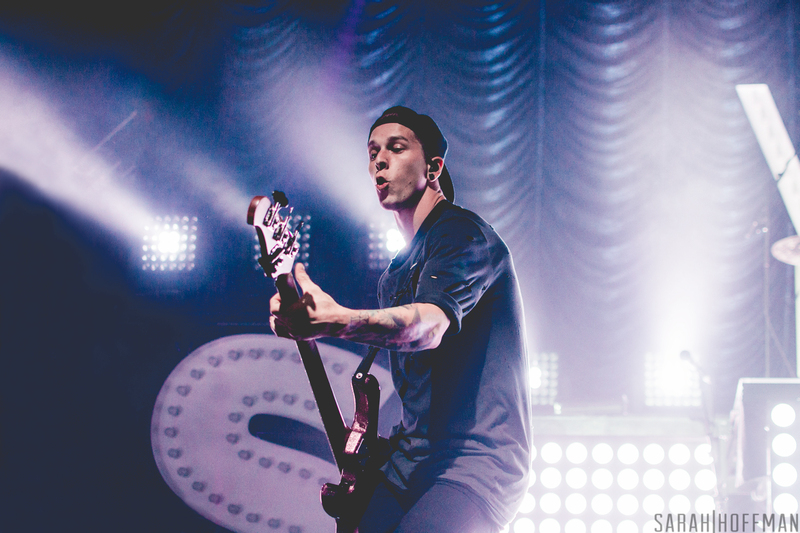 Sleeping With Sirens put on a great show with incredible production qualities. 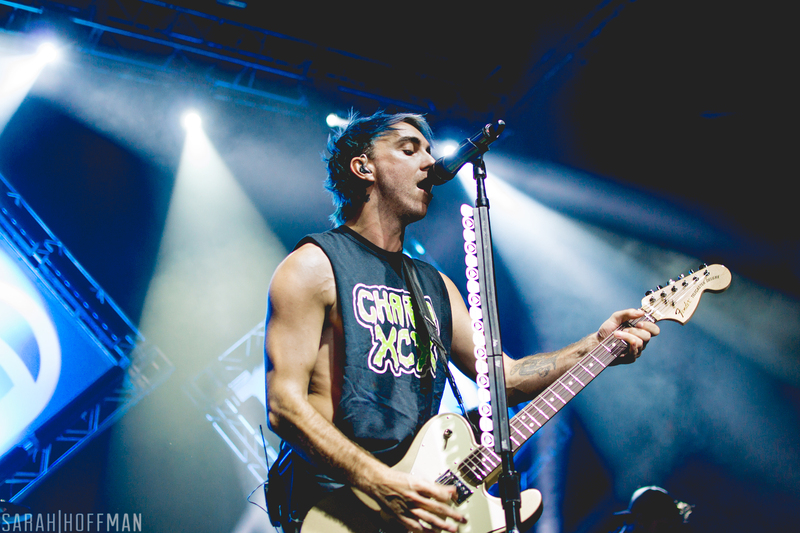 It was clear that even though All Time Low were headlining, SWS fans were in full force. Their light design, specifically the panels spelling out the acronym “SWS,” really added to the overall show on top of the carbon dioxide cannons that were choreographed with certain parts of the show. There has been an obvious increase in show production, specifically with bands of their caliber in the sort of underground, anti-mainstream scenes. Their setlist consisted of a perfect mix of old and new songs that re-captured the attention of fans of their older music, as well as excited their newfound fans of the recent Feel and Madness era. 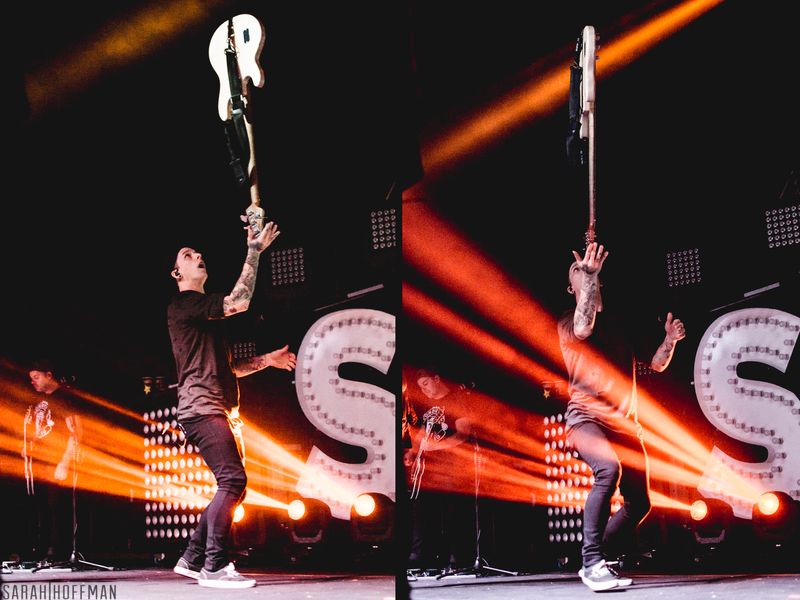 Between “Backseat Serenade” and and an old favorite, “Weightless,” All Time Low brought a fan on stage who asked to play guitar with the band. It wasn’t the first time this lucky fan was able to join All Time Low on stage; last spring, he got the chance to play a Blink-182 cover with the Baltimore rockers. Lead singer Alex Gaskarth giggled as the fan started playing “The Girl’s a Straight-Up Hustler” from their often forgotten first full-length album The Party Scene and first EP, Put Up or Shut Up. 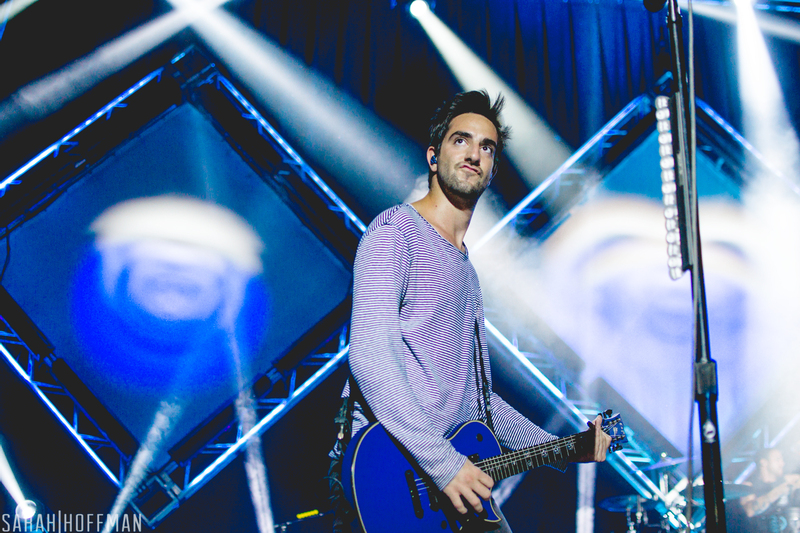 Before leaving the stage, the fan gave a heartfelt speech, thanking All Time Low for helping him realize his dream of playing guitar in a band. The sincere exchange had nearly every fan, and even the band themselves, smiling and wiping away tears. 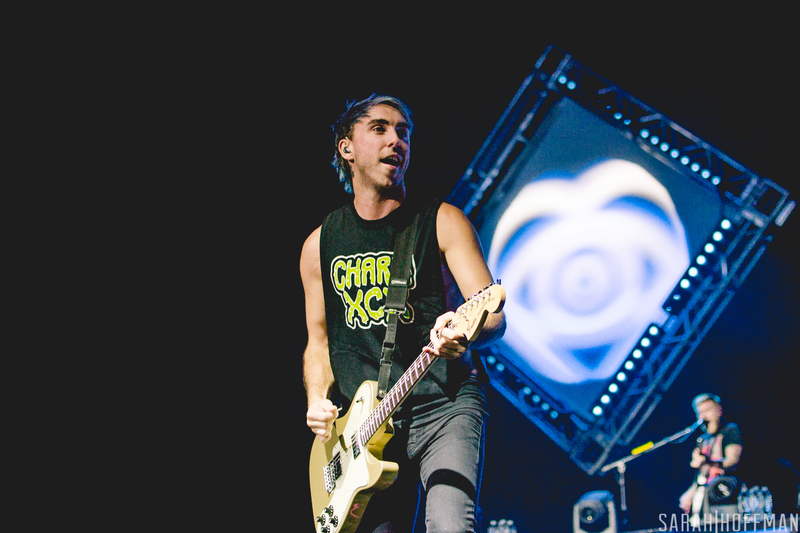 Guitarist Jack Barakat and drummer Rian Dawson rejoined Gaskarth and Merrick for perhaps the most out-of-place part of the show. They included odd song choices such as “Do You Want Me (Dead)?” from Dirty Work, “Don’t You Go” from Future Hearts, and “Poppin’ Champagne” from So Wrong, It’s Right. With the band’s vast discography, it was surprising that they seemed to pick some of the worst and least popular songs from some of their older releases. It definitely altered the energy of the show, but all of it was nearly forgotten as they closed out the show with “Old Scars/Future Hearts” and the lights on the stage went dark. They came back for a three-song encore featuring “Kids in the Dark,” “Something’s Gotta Give” and of course their most popular song, “Dear Maria, Count Me In.” Carbon dioxide and heart shaped confetti burst from cannons as Gaskarth and Barakat interacted with fans in the front row. When you go to an All Time Low show you can always expect a fantastic light show provided by their lighting technician, Jeff Maker. He’s truly a genius at his craft. It’s rare that fans, or anyone outside of the band for that matter, even know the names of crew members such as light technicians and tour managers. 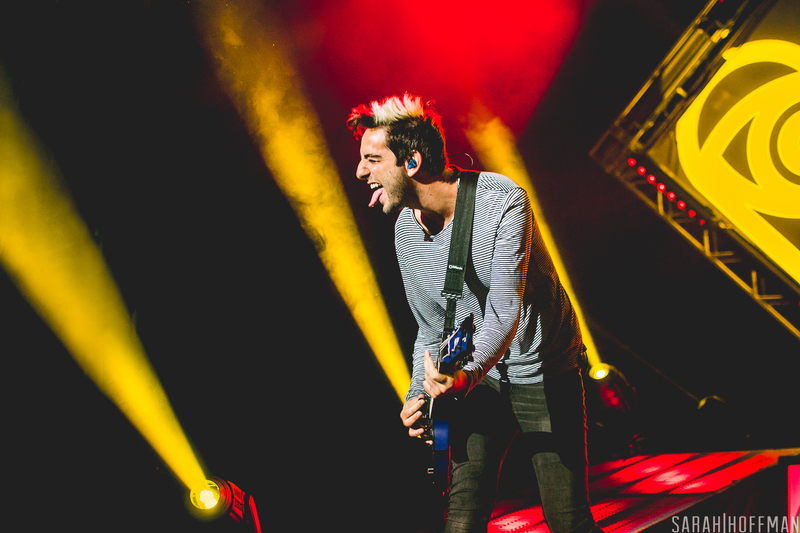 All Time Low isn’t your typical band, though. They’ve been at it for 12 years and it’s a rarity that bands keep their original lineup, especially without making additions. However, they’ve managed it, and for the most part, they’ve kept the same crew members as well who have become so adored by fans that they could almost be considered part of the lineup of the band. One of the biggest differences of this show was how much All Time Low repeated that they were having a great time and that this was one of their favorite crowds to perform in front of. It’s a cliché thing to say and bands get in the habit of repeating it too often, but this time felt so genuine. Instead of their regular inappropriate, gimmicky chatter in between songs, they showed their genuine appreciation for the fans that came to see them that night over and over again to make it a truly unforgettable night. If this tour is coming through your town and you’re looking for a visually and musically appealing shows, you won’t want to miss the Back to the Future Hearts Tour. Previous Travel Tunesday: Hit the Road, Rage.